003. SCOTT'S TERRA NOVA EXPEDITION. Issued in a series of 12 by Cadbury Bros, Ltd. (Date: Undated but believed to be 1913). Overall Size: Ca. 4.8" x 1.5" Both ends of the card were designed to be trimmed off (see number 003.7 below to see untrimmed version). Trimmed Size: Variable but ca. 2.5" x 1.5". Top end text, recto: ANTARCTIC SERIES | CAPTAIN SCOTT | EXPEDITION | 1910 - 1913 | MAY BE CUT HERE. Lower end text, recto: MAY BE CUT HERE | No. 1 [2, 3, etc.] | SERIES OF TWELVE | CADBURY BROS. LTD. | BOURNVILLE ENG. | Cocoa & Chocolate Manufacturers. Top end text, verso: BOURNVILLE | COCOA | BY TEST | THE BEST. Lower end text, verso: CADBURY'S | CHOCOLATES | UNEQUALLED | FOR QUALITY | The Mark for Purity. | [device]. NOTE: Information and image for numbers 1, 4, 6, 7, 10-12 kindly provided by Evan Jones, Wiltshire, England. 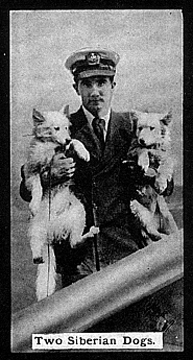 Recto: A black and white photograph within a black border showing a seaman holding two dogs. The caption reads: Two Siberian Dogs.